A great example of an Omega Pie Pan Constellation Deluxe Rose Gold St.Steel Chronometer Ref;2852 1955 in 100% original condition & offered at a great price! 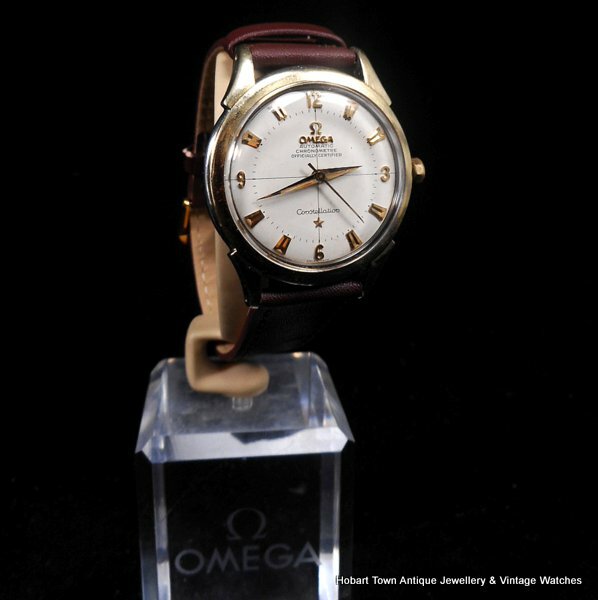 This handsome Omega Pie Pan Constellation De Luxe Rose Gold St.Steel Chronometer Ref;2852 is the first Omega Constellation that we have offered for some months. 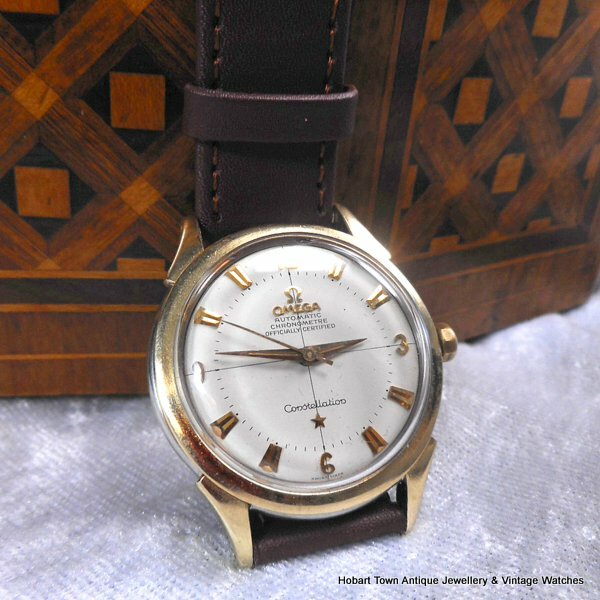 Though the wait has been worthwhile with this very appealing and totally original watch! 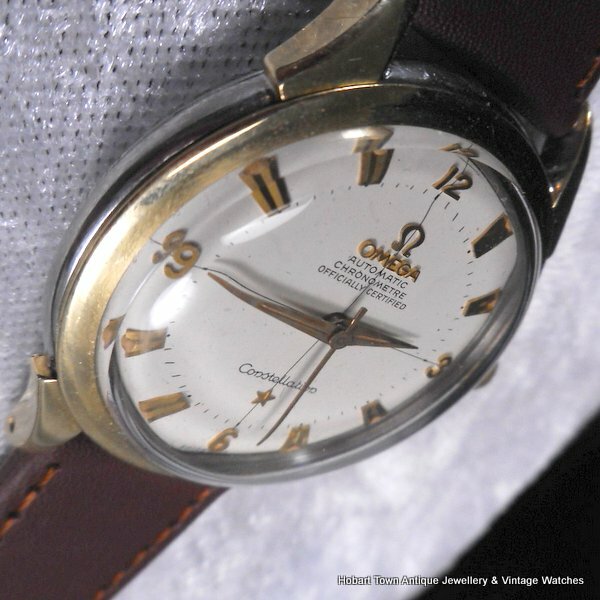 This exact model is referred to by the maker of the watch , Omega , as a pie pan dial .. even though some collectors may disagree …… Omega clearly states this dial as being a pie pan. 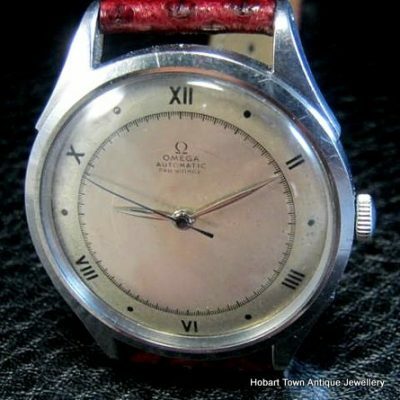 Fantastic eye catching dial in extra fine and guaranteed original condition , with no sign of a restorers brush in sight! 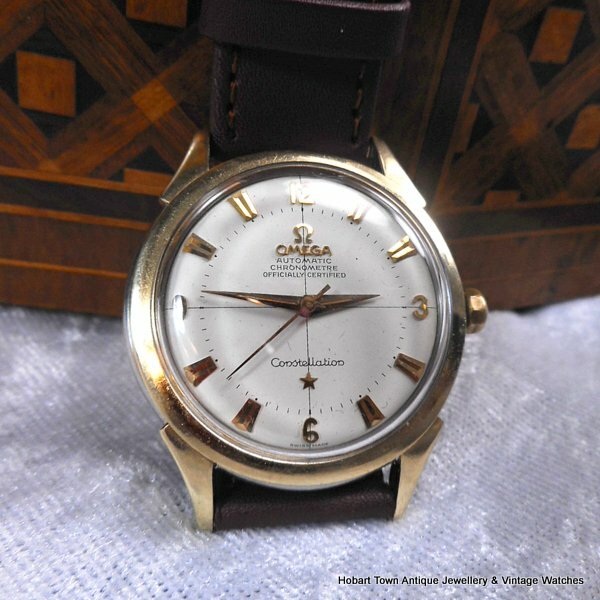 The rose gold batons , Constellation star , Omega brand name and Ω logo as we as the Arabic numerals at the 3 hour points ~ are all solid gold and all hand riveted through the dial ….. minor engineering feats with each watch dial hand made and look fantastic !! We have now replaced the metal bracelet with a new leather strap. 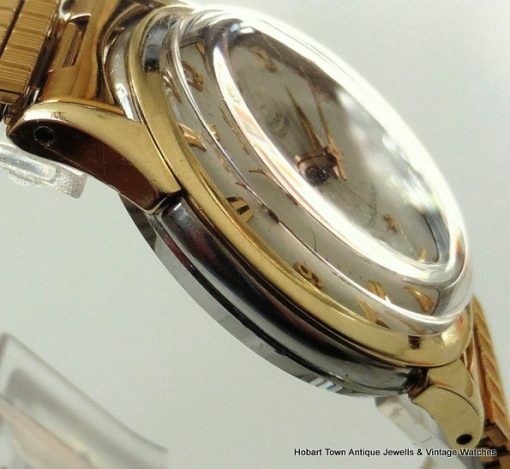 The dial is also the more sought after dial configuration. 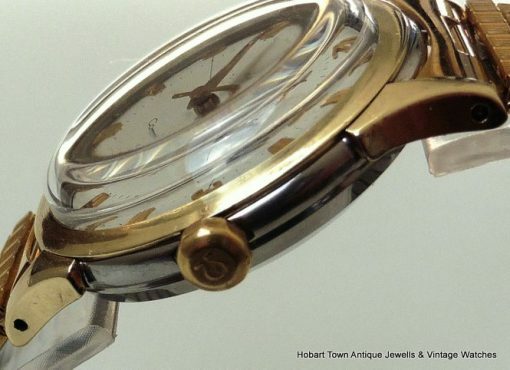 Underneath the above lays the “sniper’s crosshairs” which divide the dial into equal quadrants and has always been a very popular feature to most watches , If original to the dial ~ as this is. The gold hands and seconds sweep are all original to the dial of course. 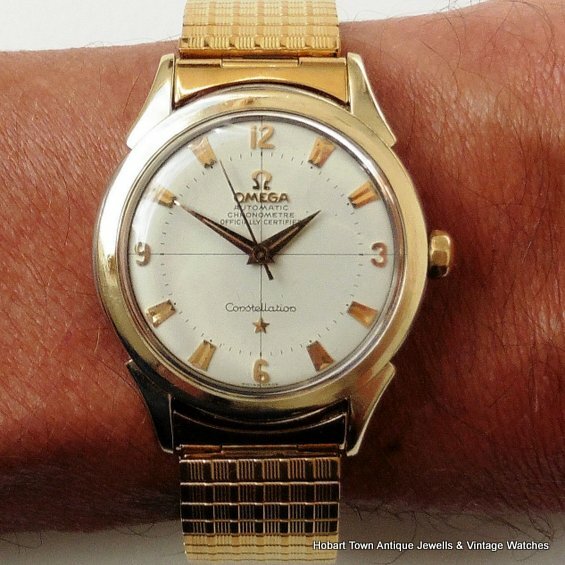 This is the Omega titled De Luxe dial model , though some were made in solid 18ct gold as well , I am not being biased when I say that I genuinely prefer the look of the rose gold / steel combination ! 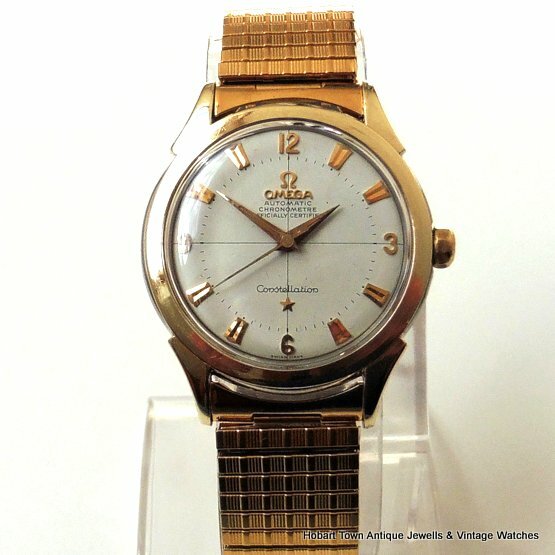 The case size of this handsome Omega Pie Pan Constellation De luxe Rose Gold St.Steel Chronometer Ref;2852 1956 model is 35m w.o.o.c. and is a beautifully designed case , given the name of gold capped by Omega. It remains in excellent condition with only minor signs of use with standard rubbing of the raised gold cupola on the case back , not too bad for a watch that turned 60 this year! Which is basically a very thick solid veneer of solid gold laid over st.steel and with this exact design of gold bezel & lug tops with st.steel sides provides an especially good appearance and my personal favourite of Omega’s gold capped case versions. 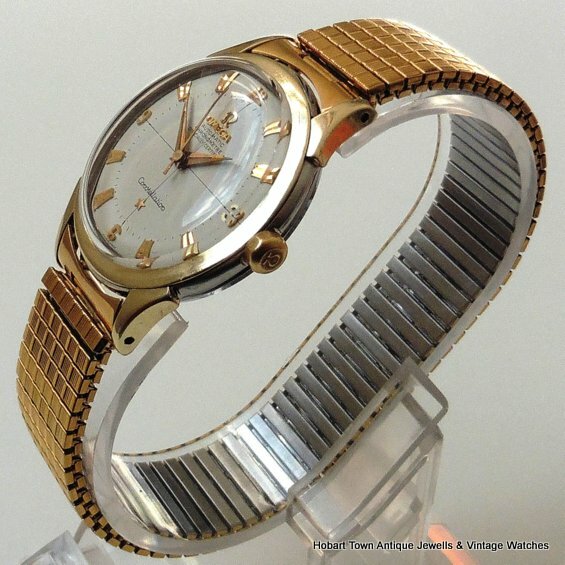 The watch was created in 1956 and this precise model only ran for one year! Housing the lesser seen 19 jewelled Cal;501 with swan neck regulator and case Ref;2852 ~ which were made for one year before going onto a 20 jewel and in the same year changed again to Cal;503 20 jewel …………. 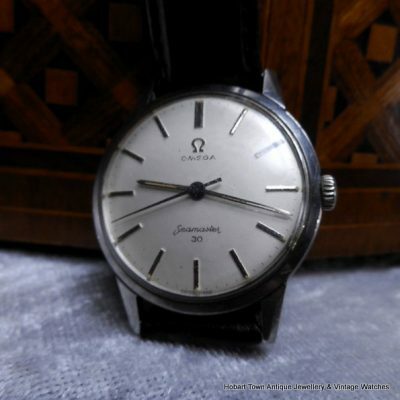 making this exact model a genuinely rare “one year production run” collector’s special , although not priced as such! Also used in the highly sought after Omega Globemaster. The movement , as you can see , is in ‘as new’ condition & these copper coloured movements look beautiful in motion and is keeping chronometer graded time! 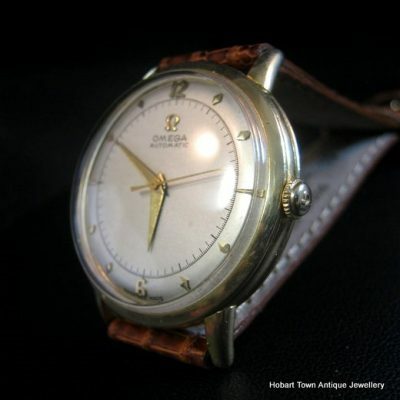 Some vintage watch admirers may not be aware of the importance , regarding a watches value , of the watch being in genuine original condition! 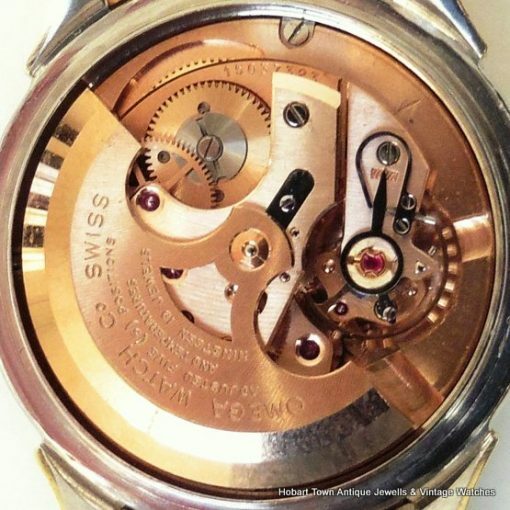 When a case back has been replaced with another case back belt the same brand yet different model with different reference numbers , that fact alone not only lowers the watches value considerably ………. it also has the effect off discouraging many collectors from even considering buying such a watch. 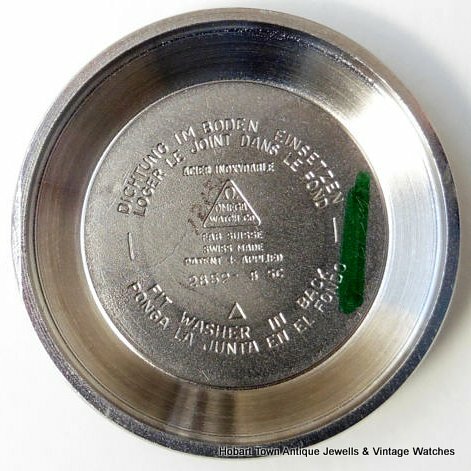 An important factor to consider on most watch purchases! 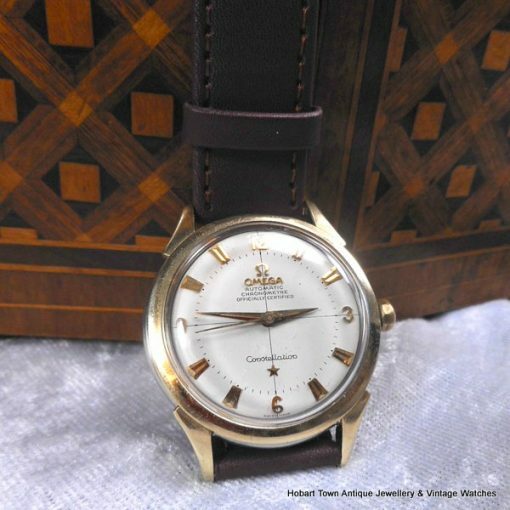 This handsome Omega Pie Pan Constellation De Luxe Rose Gold St.Steel Chronometer Ref;2852 ….. of course has all aspects covered , as for being totally original ! 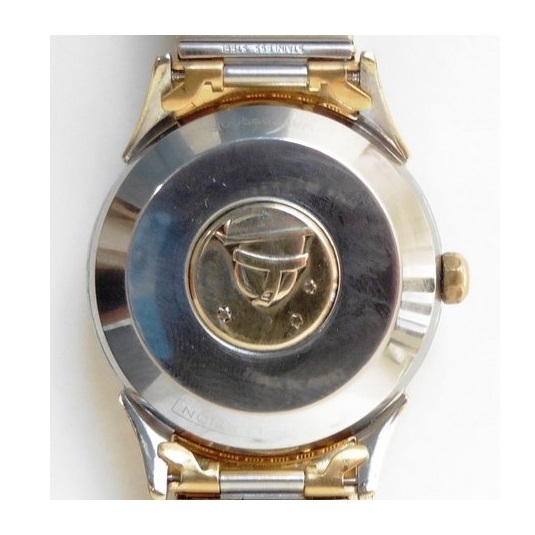 The original faceted crown still shows the Ω logo. Being sold at a genuinely good price! This watch will make an collector happy , it is about as good as this model will be found in and is better than many “non De Luxe Constellations” ! 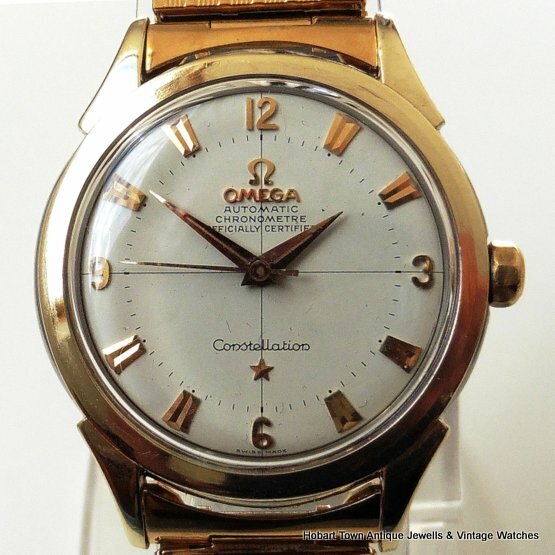 If you have any questions regarding this genuinely superior model Omega Pie Pan Constellation De luxe Rose Gold St.Steel Chronometer Ref;2852 please email and we will respond ASAP. 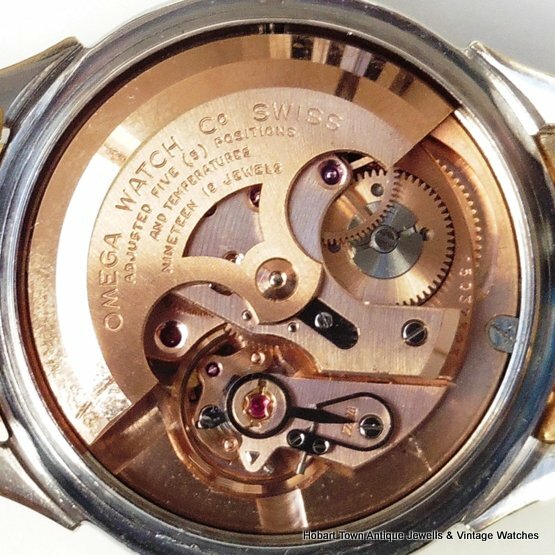 ALL WATCHES CARRY A 100% MONEY BACK GUARANTEE THAT THEY ARE AS DESCRIBED.